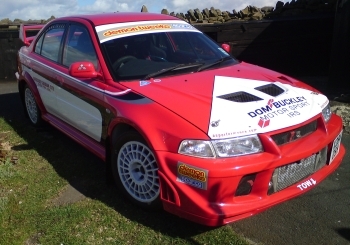 Pete Gibson and Adam Bradford debuted their new Mitsubishi Lancer Evo 6 rally car at the Horiba Dâ€™Isis Stages based at MIRA (Motor Industries Research Association) near Nuneaton. This was the pairingâ€™s first time in the new car, having made the step up from a 1600cc Vauxhall Nova, and also their first visit to MIRA. The teamâ€™s aim was to learn as much as possible about the new car and adjust any settings to Peteâ€™s liking. The first two stages passed without problem, and Peteâ€™s confidence in the car was growing all the time, and the lads were lying a respectable 21st overall. During service, some minor suspension settings were changed, which certainly helped, as after two more clean stages Pete and Adam were making good progress up the leader board, lying 17th overall going into the afternoon stages. Near the end of the fifth stage, Pete was caught out by the ever present Armco barriers around the stages; in a very tight section after a hairpin the front of the Mitsubishi struck the barrier. Once the crew restarted the car it was very apparent there was more than just cosmetic damage, as the Mitsubishi was very low on power, and once into service it was discovered a turbo pipe had been partially crushed in the impact. The accident meant the team lost about 20 seconds on that stage, but fortunately there was less than a mile to go with the reduced power. Back in Service the team managed to mend the turbo pipe and tidy the bumper and wing of the car as best as they could within time, enabling them to contest the remaining three stages without further trouble. Pete was gaining speed and confidence in the car all the time, and despite a short venture onto the grass around the stage, the pace was picking up, and further fine tuning of the suspension settings helped to improve times as the day progressed. Pete and Adam finished 13th overall, the pairings best result to date. With this being their first event in the new car, there is obviously a great deal of potential to improve their results in further events this year as Pete becomes more familiar in the driving seat of this particular car.